Cyber attacks on drilling control systems can cause enormous harm to people, the environment and equipment. The drilling process cannot simply stop if such an event is detected. Further, it’s possible that the response to a cyber attack can even worsen the situation. These guidelines, the only guidance specifically for drilling operations, draws from international standards to provide a means to assess the risk to drilling rigs from cyber attacks. Developed under the auspices of the IADC Cybersecurity Subcommittee. 25 pages. ©IADC. All Rights reserved. This eBook contains a sample of the “IADC Cybersecurity Risk Assessment Support Tool”. 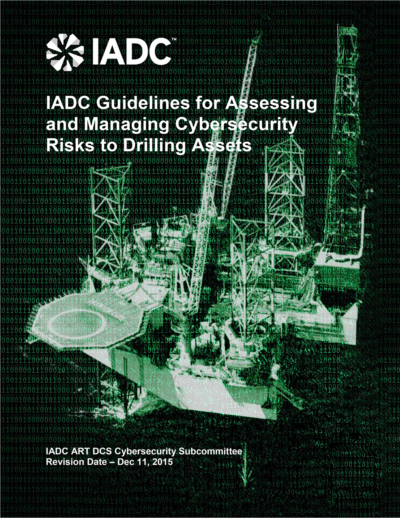 This tool is freely available to IADC members and to purchasers of the “IADC Guidelines for Assessing and Managing Cybersecurity Risks to Drilling Assets” through this link.